I participated in the above last week Monday; below is the team photograph followed by some photos taken by me along the route through the West End and Green and Hyde Parks. We were also amongst those featured in the Law Society Gazette. Thank God for Christopher Savoie. I always remember the American father who forced Tokyo to act on the Hague Convention on International Child Abduction. 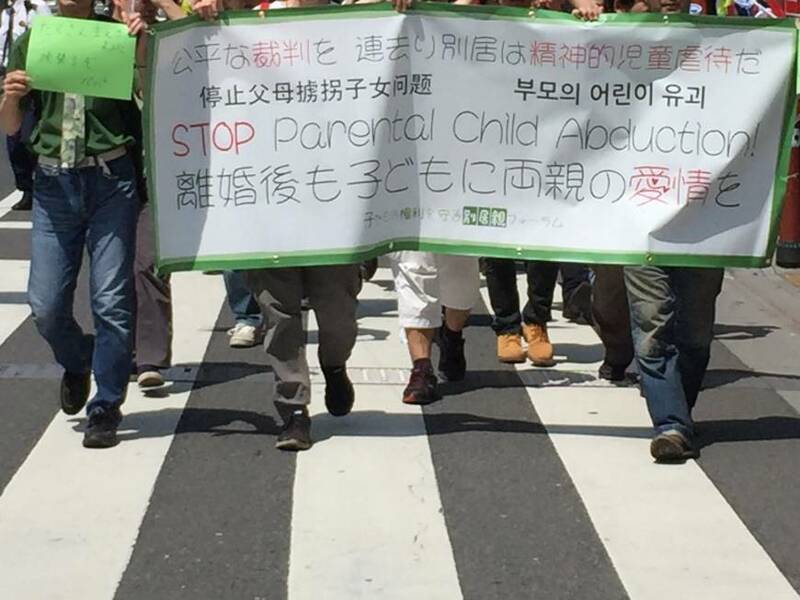 “Years after Hague signing, parent who abducts still wins” in the May 1 edition and “Parental abduction victims hold rally to push for joint custody rights” in the May 6 edition are the most recent additions to my thick file of Japan Times stories on this issue which I began keeping in September 2009. This is when Christopher Savoie famously, valiantly, virtuously and rightly tried to reclaim his kidnapped children from his Japanese ex-wife by seeking asylum inside the U.S. Consulate in Fukuoka. “Asylum” is self-evidently the right word for it. Ultimately, he failed. The consulate turned him over to Japanese authorities, but the Fukuoka police and prosecutors dropped their case and deported him instead. Prosecuting him would have been too shameful for Japan and cast the country in a humiliating bad light internationally. It was a textbook example of how it (sometimes) takes foreign pressure to move Japan forward. More attention has been given to the plight of children and their alienated parents since then, but the application of the Hague Convention is not satisfactory. To make it satisfactory requires starting with acknowledging and treating the abducting parent (usually but not exclusively their Japanese mothers) as criminal kidnappers. Active intervention to repatriate the children followed by the prosecution and long imprisonment of the kidnapper are not excessive suggestions. I have just mailed you some items for Children’s Day last week. The book is one that I liked when I was your age or a little older. Not sure how you celebrate Children’s Day but hope it was a good day.